It's been almost 5 years since Firewind's last record, Few Against Many, was out and naturally this quite extended interval is a result of main man Gus G.'s activities with the Ozzy Osbourne band and with making 2 solo records along the road. So, as Ozzy is making some TV series with his son Jack, what chores are there else to carry through besides putting together a new Firewind album? 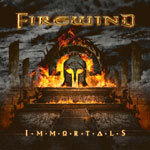 Immortals is the eighth full-length and also the first concept album from the band and very unsurprisingly the story is about a couple of things taking place in ancient Greek history. It's built around a natural power metal foundation, but has more emphasis on the guitar play with riffing and licks than what this type of music usually has and it's making the record a little bit heavier as a whole. The guitar playing is thus a clear feature that the band holds and quite the only attribute that separates this unit from what's out there, but at the same time it kind of live a life on its own in the songs every now and then and sometimes it fits the music perfectly and sometimes it doesn't. The band has with German singer Henning Basse once again a new guy putting down vocals on a record. He's already a familiar face in the power metal circuit, mainly because of his long-time involvement with Metalium of course, and he has worked with Gus on stage on a few occasions before with both the latter one's solo stuff recently and with Firewind material about a decade ago, making this transition an easy one for the band probably. Henning definitely comes out with a performance that's expected out of him, but since the vocal melodies aren't the top priority on the album he can't take the whole thing to a different plane in the end. I don't think that the band is able to put forward truly great songs this time. Every single track is on a decent to good level and the record is indeed even in song quality without any real pits. From start to finish the whole group of musicians seem confident with what they do and they're trying hard to come out with convincing stuff, yet at the end of the day they can't really execute and make Immortals a special album.